A shellac finish has been used by woodworkers since the early 1800's. Shellac is non-toxic, can be used as a sealer before applying a stain, can be mixed with nearly any color and is easy to repair in the event of damage from use. That being said, there are some drawbacks to using shellac as a final wood finish; shellac does not hold up well to heat or water, and it dries quickly when being applied, which leads many woodworkers to believe that applying a ​proper shellac finish can be difficult. Shellac is derived from a resin that is secreted from an insect native to certain forests in southeast Asia. This insect secretion is scraped from the bark of trees and when processed, takes the form of small, light-brown or orange flakes. To make an applicable woodworking finish, these flakes are mixed with alcohol. Woodworkers commonly use a two-pound-cut finish, which is to say a ratio of two pounds of shellac flakes per gallon of alcohol. Pre-mixed shellac found in home centers may be three-pound, but this can be cut if desired. 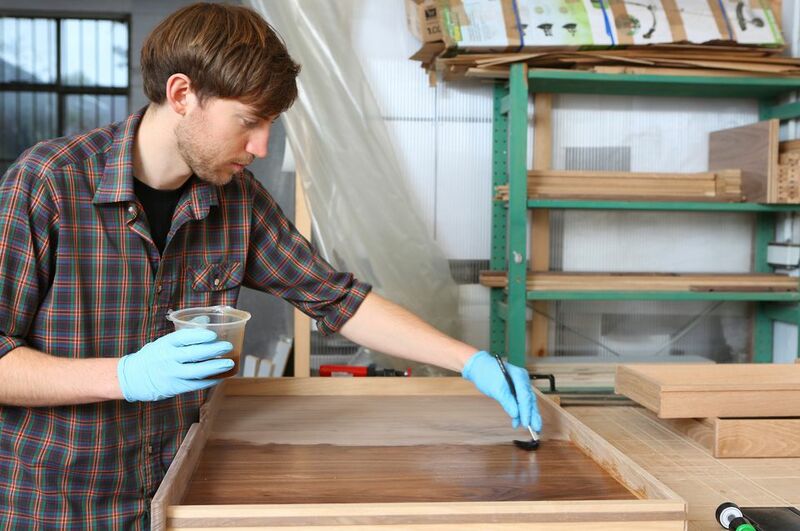 There are two commonly accepted methods for applying shellac: brushing and padding. To brush on shellac, use a fine, natural or china-bristle brush. Use a two or three-pound cut of shellac and apply generously with long, smooth strokes. Since shellac dries quickly, be careful to avoid drips or blotchy areas when applying because unlike other finishes, you will likely not have time to over-brush to eliminate the blemish. To apply shellac with a pad, use a clean piece of medium-weight cotton muslin. Lay down a smooth, even application of shellac in a single long, even stroke. Before beginning to apply the shellac, place your cut of shellac into a squeeze bottle. Squeeze a liberal amount of shellac into the sock to act as a reservoir. Then wrap the muslin around the sock and hold the edges of the muslin behind the sock. Squeezing the pad lightly should allow a small amount of shellac to seep through the muslin. The exposed shellac on the muslin surface of the pad should be even with no dripping. When applying the pad to your woodworking project, you may need a bit of a lubricant. Mineral oil works great, as it will not affect the final color or finish. If your padding movement seems a bit "sticky," keep a small bowl with a little bit of mineral oil handy for light dipping. With a very small amount of mineral oil on the loaded pad, you're ready to begin applying the shellac to the wood. To start, do not place the pad directly onto the wood and begin rubbing; instead, ease the pad on and off the stock to avoid any blotchy spots. The best way to describe the motion is to work much like an airplane taking off and landing. Many woodworkers like to use a combination of brushing and padding. They will apply the shellac with a brush and then immediately smooth it out with a piece of muslin. Use long strokes moving with the grain of the stock. This direct application will result in a high-gloss finish. If a less glossy, satin finish is preferred, try buffing out the final coat with some 0000 steel wool and (non-silicon based) paste wax. Lightly work the wax over the finish until it is thoroughly covered. Allow the wax to dry and then wipe off and buff to a lustrous finish. Brushes can be easily cleaned after applying shellac with alcohol, as this will effectively cut the shellac until the brush is clean. The alkaline ammonia dissolves the shellac quickly and easily. After the shellac is completely gone, wash the brush with soap and warm water to keep the bristles soft. Dry the bristles and store the brush in the container in which it came.